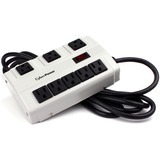 Designed for job sites and high traffic areas, the B6010MGY Heavy-Duty Surge Protector from CyberPower provides eight surge-protected outlets (three widely spaced to accommodate large AC plugs) and a 10-foot power cord. This metal-housed surge suppressor, rated at 900 joules, absorbs excess voltages from electrical surges and spikes that can damage electronic devices and sensitive equipment. Multiple electrical devices can be connected to a single AC wall socket. The B6010MGY Heavy-Duty Surge Protector is ideal for use with rechargeable tools, small electronics, and power tools. Features include an LED indicator, an integrated 15-Amp circuit breaker with on/off switch, and keyhole mounting slots. The B6010MGY Heavy-Duty Surge Protector comes with a user manual and is backed by a Lifetime Limited Warranty and a $50,000 Connected Equipment Guarantee.